With our focus on apples this week, it is appropriate to highlight a few apple cookbooks. My favorite was Apple Cookbook by Olwen Woodier. This book gives a history of apples and plenty of helpful information on cooking with apples before delving into the recipes. Chapter titles include: Breakfast and Breads, Drinks and Snacks, Salads and Sides, Apples Make the Meal, Apple Pies and Cakes and Apple Desserts. Thumbing through a book like this every so often reminds me just how much variety is possible with one ingredient. There are all the expected items: apple bread, apple crisp, apple pie, etc. But then you run across something like Apple Ratatouille or Curried Apple Meat Loaf and it makes you think. Even if you don't fancy that particular recipe, it spurs your mind onto new horizons. I decided to try Apple Pancakes. 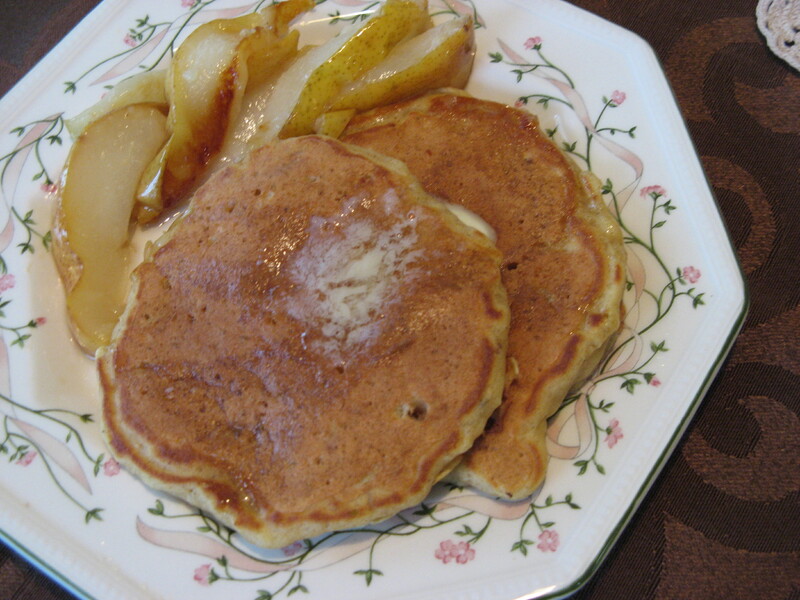 They were delicious, especially paired with real maple syrup and some sauteed pears I put on the side. The children gave them two thumbs up. Place the flour, baking powder, baking soda, and cinnamon in a large mixing bowl, blender, or food processor. Add the sour cream, apple juice, sugar, butter, and eggs. Beat or blend until smooth. The batter will be very thick. Allow the batter to rest for 30-60 minutes (I only had 15 minutes). Core and grate the apples. Stir into the batter. Heat a heavy skillet over medium-high heat and grease with approximately 1 teaspoon vegetable oil. Drop the batter onto the hot griddle a few tablespoons at a time (for large pancakes, measure 1/4 cup batter). I also found it a mind-expanding exercise to look through Apple Pie Perfect by Ken Haedrich. While I tend to like my apple pie the same way each time, it was fun to imagine what it might be like to try an apple and pear pie, or an apple cheesecake pie, or maybe a maple apple pie. I did try the apple-raspberry pie and the taste combination was wonderful, although the method for making it seemed more complicated than it needed to be. I'll be trying my own version next time. Another book that just happened to cross my path is one entitled The Magic Apple Tree: A Country Year by Susan Hill. This is a sweet little memoir of seasonal life in the English countryside some thirty years ago. It is not a fast-paced book, but is filled with descriptions of nature, hearth and home, and local customs. It's a book to read by the fire with a hot cup of cider. Our Apple Treeby Naslund and Digman and The Apple Pie Tree by Hall and Halpern are two lovely childrens' books that describe the life cycle of the apple tree and would be perfect to read to young ones at this time of the year. Do you have a local source for maple syrup or do you buy it from the store?